That was… creepy! When it comes to scary stuff, I always start off with the ‘I can handle this’ mentality. I mean it’s all in your head, right? And then once I start reading, I definitely felt the creepy vibes. 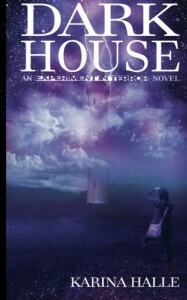 Darkhouse wasn’t what I thought it was going to be. I thought it was going to be more… serious. I don’t know what I was expecting, but it wasn’t cameraman Dex and receptionist Perry going on a ghost busting adventure. I have to say; I wasn’t sold on the book at first. The beginning was actually a little (dare I say?) boring. There were some moments where I wanted to skip some pages and get to the interesting stuff. Eventually, it did get more interesting and even captivated me at some points. Perry kept me laughing throughout the whole book. I loved that she wasn’t one of those typical heroines with the perfect face and body. I found her flaws charming and made everything more realistic. As much as I love Perry, Dex’s character was my favorite. He was so unique. At first I wasn’t too sure I was going to like him. I mean, one second he was all nice and chipper, and the next second he was dark and broody. But soon, I figured it was just all part of his charm. One thing that always kept me hooked was the banter in the book. I was constantly laughing. I liked the strange relationship Dex and Perry. It was light and easy, but had several moments of intensity. And as someone who loves romance, I really wanted something to happen with them. I mean, couldn’t we get something? A kiss? A hug? Hell, in the state I was in, I’d have taken anything. It was so frustrating. I was really freaked out. That crazy lady with the horrible makeup would have had me sh*tting my pants. There isn’t even a level of weird to describe her as; I just wanted Perry to run the other way every time she came up. Overall, it was an entertaining read but I felt it could have used a little more.